I don't really do New Year's resolutions. And besides the new year has passed, sorta. But in the light of making improvements, I have been working on one thing. Well on a few maybe but this one is the most important and lasting. 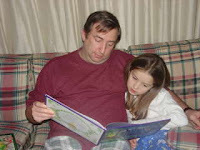 I have been trying to make a point to spend more quality time with my kids. Not just time...but the kind of time that they will remember. You know it is easier to remember the negative things and more difficult to remember all the positive. So I am making an effort to be, on the whole, spending more quality-positive time with my kids. I think this has stemmed from the fact that I am working full time now. I had gone from being a missionary mom who was sometimes not home. To a full time stay at home mom then to a full time at work mom. We have all gone through a lot of changes over the past almost year. I am trying not to raise my voice so much and praise good behavior. It is not any easy job, nobody said it would be easy. But it is so worthy and worth it. My children are so worth it. 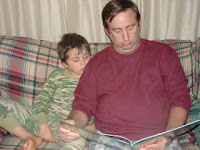 Word of explination on the pic's...ok so that is my husband reading our 2 older kids a story, not me. But it is a picture of spending quality time. Just in case you needed an example! I happened to have all 4 kids with me and when the alarm went off I turned to them and said "ok, empty you pockets!" It turns out Little Miss A, the 3 year old had put a ring (big fake one) in the front pocket of her sweater! I asked her what happened and she said it was an accident. Well, I had let them look at the jewelry while I was busy and I expected her older siblings to keep an 'eye' on her. I guess I was asking for it. Sheesh, but it was still embarrassing. I did explain to her that that is called stealing. Even if she didn't realize what she had done. Working for the school district+school cancelled = No work!! Yeah I stay home today with the kids! So the only bummer is I woke up at 6:15...oh well. 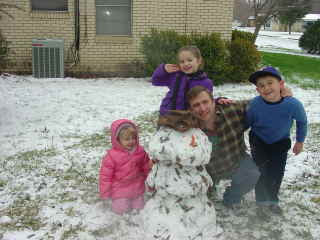 But we did make a funky little leaf filled snowman the size of my 3 year old. Can you see the brown hat and the carrot? Hey, I'm from California and have been in Mexico for many years so this little snow is a big deal for us! You better not be laughing at us! The backyard looks even more white. And 'our' school was not cancelled. Meaning, because we homeschool and becacause my husband is a diehard (I say that in a loving, endearing and affecionate way) my kids are still being schooled. Which is why I am doing my 'thing' and catching up on housework...oops..and blogging! But it sure does look pretty outside! I don't know what it is about my 3 year old but she is always saying the darndest things. She has a nack for being uncommonly and comicaly honest. Little Miss A. tends to be the louddest of the bunch and I have to ask her frequently to 'bring it down a notch', to calm down and so one time I asked her to "turn her volume down"
Well she so matter of factly told me, "my volume is broken." Well, yeah...I guess that goes without saying...never mind. And today after she was done using the bathroom I told her to remember to wash her hands and that I could turn off the light for her. This is because the light is in a strange place in our bathroom, it is by the sink and nowhere near the door. Many times she has just climbed on the sink herself and turned it off. Well obviously I am trying to break her of that, but she informed me, "I can climb up there and turn it off mommy, I'm a monkey." Yes my dear you are, but monkeys can still fall and bust their cute little monkey heads. No I did not say that to her, but man she can be so very honest that it cracks me up. I am so very grateful that I have a job, really I am. But I am also grateful for a 4 day weekend. Martin Luther King day is on Monday. Well since we home school, we'll do a short day. My husband is the one who stays at home and does the schooling, cooking and cleaning. Yes, he is a rare breed. But we will have a lesson about who Martin Luther King is and how he affected history. That will be the extent of our school on Monday. Sounds fair to me. If they are not going to have a full day of school and Mommy is off of work (I work for the local school district) and gets to spend time with them, then it makes sense to learn why. 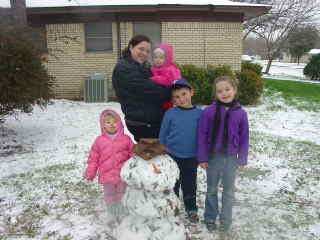 I am looking forward to the extra day with the kids and hubby, of course! On that note, we had some bad weather here and the power went out temporarily. So we all sat down and played a game together. We do have game nights sometimes, but why is it that when the power goes out we actually spend quality time together as a family? Do you find this to be true? Ladies..I cannot say enough thank you's for praying for my family!! We are up to date with the car now! There are other utilities that are outstanding but we are believing that the rest will come in. I was talking with a friend, who has been going through even more difficult trials than I, that it is at times like this that we must choose peace. There can be so much stress and trials taking place in your life and you really don't know how to respond, or you respond purely from emotion that makes it difficult to funcion. This also affects those around you and it is a challenge when you have little onnes that depend on your care. I have to chose peace and to be at peace. I do not always do that...I am human. But I have been doing better. I really do appreciate your prayers, please do continue to pray for us when you think of us. I do not know how many actually read my blog daily, weekly or even at all. But I need to put a prayer request out. It is one I am sure we have all experienced at one time or another. We have been going through a difficult time financially for a while, but things started to get a little better after I got my job. We had a recent setback and now we are back to square one. Or shall I say negative square one. It is no fun to blog about these kind of situations but it is life and it is where we are at. A while back we were too close to being evicted and now we are too close to our car being taken (repo). There are other things as well but it is the whole financial can of worms. I humbly ask for your prayers. I think I have enjoyed my Christmas break too much. Being at home with my Hubby and kids has been so very nice. I work for the school district so I got about 2 weeks off from work! Wonderful! But now I groan....uuugh.....I go to two staff develpment days and then to work again on Monday. I think I am pretty well developed, must I go? 'Sigh'... it is like the kid having to wake up and go to school and he groans...."just 5 more minutes ma!" Yeah...I just want a few more days!!! Please!